Struggling to find that perfect gift for your loved one this holiday season? We’ve pulled together some great suggestions that you can pick up right here in Grinnell! Atmosphere Vapors has nearly anything and everything related to vaping. Not sure where to start? Their friendly staff can help you pick the perfect product or they also have gift cards available for purchase. Peace Tree Brewing Companyhas all your favorite flavors of Iowa beer. Get a six-pack or growler along with a t-shirt, bottle opener, or hat so they can represent their favorite beer anywhere. Solera has a number of wines and beers available for purchase perfect for gifts or the holiday parties on your calendar. They’ll also gift-wrap your presents or gift baskets if you need it! Tassel Ridge Winery is just a short drive south from Grinnell but with nearly 40 wines on their list it’s the perfect gift for the wine connoisseur on your list. They also have a great selection of wine related gifts and food! Van Wijk Winery is just down the road in Sully has a great selection of wine and beer with the addition of specialty coffee and tea! Treat your special person to an afternoon out at their cozy tasting room or join them for one of their weekly events. Bates Flowers by DZyne can create a beautiful bouquet of fresh flowers or pick up a succulent for those who like to grow their own. With the addition of great home decorations, Bate’s has a little something for everyone. Grinnell Farmers Market vendors have product available locally in the off-season. Check out the list of participating vendors at www.grinnellfarmersmarket.com You can also purchase Farmers Market gift certificates to be used for the 2019 market at the Grinnell Chamber office. Call 641-236-6555 for more details. Theisen’s offers everything you need for the gardener in your life. Grab outdoor supplies available now or pick up a gift card they can use on flowers come spring. Acupuncture Clinic of Grinnell offers everything needed to get your mind clear this holiday season. From acupuncture, to Feng Shui to Herbal Medicine, Anne Stephens can provide personalized treatment programs for anyone. Anytime Fitnessis currently running a special with 2 months of membership free when you sign up for a full year! They’ve got brand new equipment, personal trainers, and supplements available to help your loved ones achieve their fitness goals. Gift certificates are available. Bikes to You has all the gear your bike rider will need for 2019. With options like clothing and headlights, bike locks and water bottles, or maybe even a new bike, there’s something for every skill level available. Brown's Shoe Fit has a great selection of running shoes for your loved one to step into the new year in style! Grinnell College Golf Course can help you get your golfer ready for the 2019 season. Their pro-shop has all the latest gear and can be shopped in person or online! You can also purchase 2019 season passes or pick up a gift card online. Oakland Acres Golf Club has 2019 membership on sale or purchase a gift certificate for your future PGA golfer to practice their swing on the indoor simulators. Paul W Ahrens Fitness Center & Crossfit Poweshiek are conveniently located downtown with access to personal trainers and nutritionists to help you get back on track this holiday season. Postel’s Community Health Park offers a variety of services from massage and relaxation therapies to salt scrubs, body wraps and more. They also have essential oils available for purchase! Give the gift of relaxation with a gift certificate. They’re currently running a special, buy $100 for $80! Sadler Acupuncture specialized in pain treatment. With patient-centered care, Danielle can help you or your loved one start the year off feeling less pain. Awards Unlimited has all the GHS gear your friends and family need to cheer on the Tigers in 2019. Giggles and Bows can keep your little Cyclone or Hawkeye ready for game day with a huge selection of ISU or Iowa gear. Loralei’s Giftshoppe has unique Home Sweet Iowa decorations and Iowa made candles so you and your loved ones can sport your Iowa Pride in every room of the house! Pioneer Bookshop brings Pioneer Pride downtown with their great selection of Grinnell College gear. They also have a cool new Grinnell, Iowa sweatshirt. Stop by and pick one up – supplies are limited! Anna Kayte’s Boutique has all the latest fashion for the ladies in your life. Shop online and pick up in store! Bill’s Jewelry has you covered if you’re looking for something a little sparkly under the tree this year. Spend $500 and get $50 off! The Glass Gift Box gives you the ability to pull double duty this holiday season. The latest in-home décor and women’s fashion with proceeds going to the hospital’s Auxiliary it’s a perfect place to shop and give back. Lil’ Miss Chic Children’s Boutique will make sure your girls are perfectly dressed with great casual pieces and runway ready outfits for all those holiday parties. Phase 2 Consignments brings men and women’s gently used fashion to downtown Grinnell, making it convenient to pick up a few pieces this holiday season. They also have a great selection of kids’ clothes and jewelry! Wagon Wheels West has all your men’s and women’s western wear, accessories, and home décor. Pick up a gift certificate to Los Girasoles, Pagliai’s, Relish, Periodic Table, Pizza Ranch or Peppertree at the Depot Crossing and give the gift of a night out and a happy belly this holiday season. Treat your friend of coworker to a well-deserved lunch on you at 1854 Deli, Chuong Garden or Frontier Café! Pick up a gift card to Hy-Vee, Fareway, or McNally’s for those who love to do their own cooking. Give the gift of forever memories with a photo package by Cory Hall Photography, Jennifer Weinman Photography or Jessica Greenwell Photography. All our local photographers do studio portraits or travel to where your family is most comfortable! Total Choice Shipping & Printing can put those new photos on beautiful canvases or photo cards for you to share this holiday season. Don’t forget they can ship all of your gifts as well! Ballyhoo in Ink can personalize nearly anything you can imagine (they often hand out their logo printed on a walnut shell) along with custom t-shirts, mugs, signs, and more. If you can dream it, they can make it happen. Beckman Gallery & Gifts has beautiful custom frames for all those new family photos so they can be displayed in your loved one’s home. Stepping Stones Christian Bookstore has a great selection of unique gifts this holiday season. From ornaments to home décor, books and calendars, to cards and gift bags, stop by and find that perfect gift for your loved one. Looking for the ever-popular chalk paint? Perhaps a new set of tools or planters are on someone’s wish list. Paul’s Ace Hardware has all the supplies and gear your DIY-er needs this holiday season. Not sure what to get? Gift cards are always a great selection! Malcolm Lumber has the materials for all your woodworking projects (including pallets)! After touring their new kitchen and bath studio you may want to give yourself a big something this holiday season. Village Decorating Studio will be your go-to stop for the HGTV lover in your home. Flooring, window treatments, cabinetry, paint and more, Lori and her team will help you design the house of your dreams this holiday season. Hair of the Dog Salon can pamper your best friend with a wash, a groom or you can pick up a new toy and treat to keep them busy while everyone else is opening presents. With a great selection of healthy dog food, your best bud is sure to be wagging their tail this holiday season. Poweshiek Animal Shelter’s PALS Park membership is the perfect gift to get your buddy out and playing in 2019. Their 2.5 acre space features a wooded walk area, agility training equipment and a separate space for small dogs! If your loved one is traveling this holiday season, treat them to a tune up and check with Linder Tire to make sure they make it to their destination safely! Arnold Motor Supply and Napa Auto Parts have all the pieces your gear head needs to do their own work. Gift cards are available at both locations! We haven’t had snow yet but we’re sure to get some this winter so give the gift of safety with new winter tires from Grinnell Firestone this holiday season! Give the gift of the ultimate garage update – a new car! Steve Link Ford Lincoln and Wes Finch Auto Plaza have great options for those looking to drive into 2019 in style. New furniture from Uhlmann’s Home Furnishings will ensure your loved one (or yourself) is perfectly comfortable while unwrapping gifts or watching your favorite movies this holiday season. Trying to stay in touch more in 2019? A new phone or tablet from US Cellular or Verizon would be a perfect fit. They also have a great supply of accessories for all your electronic devices! Give the gift of new appliances from Starnes TV & Appliance! Still aren't sure what to get them? Grinnell Bucks always make a great gift! Have you been out searching for the perfect gift for family and friends? I'll be honest, I haven't begun shopping yet or given it much thought but I'm excited to look local this weekend! As the holiday season gears up, I am also reminded of the many opportunities we have to give back to our community. Whether to individuals, organizations or groups, there are many ways to contribute during this season of giving. Donate to any nonprofit organization. NPO's are doing great work in and around our community, and need our support! Give non-perishable food and toiletry items to MICA's pantry. Cheer up our furry friends at PALS by donating supplies, money or your time. Give a book or a blanket (or both!) to the 3rd Annual Covered Kids Books & Blankets Drive. Donate a coat, hats and gloves for the cold weather season. Items can be given to MICA or Second Mile. Give a new, unwrapped toy to Grinnell Realty's Toy Drive! However you choose to spend your time and dollars this holiday season, thank you for considering the ways we can work together to support our fellow Grinnellians and continue to make this a wonderful community by helping our groups and organizations doing such important work. p.s. Many holiday festivities are taking place this evening and tomorrow. Check them out here! Tomorrow evening marks one of my favorite nights in Grinnell: an evening to help us welcome the holiday season! 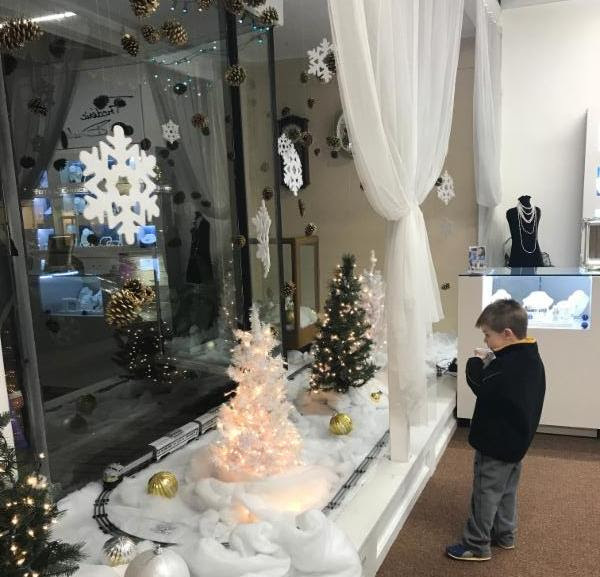 Jingle Bell Holiday is set as a kick-off to the holiday season in an effort to keep more sales local and encourage customers to see what our businesses have to offer right here in our community. It's a fun-filled evening giving the opportunity to get out and explore our retail community - downtown sidewalks are filled with people, horse-drawn carriage rides are circling downtown, families are out enjoying treats and crafts and all the shops are decorated for the holidays. What's equally great about this event is that many service businesses and non-profit organizations get involved as well - it's wonderful to see our community come together in this way. And this year, our Central Park Holiday decorations and team will be debuting their work during Jingle Bell Holiday! This team of dedicated volunteers has been meeting and working diligently for the past couple months and I'm so excited for you all to see their hard work come to fruition. Please take a minute Friday evening and throughout the next month and a half to say 'thank you' to this team of community members for helping pull everything together! Jingle Bell Holiday activities are set for 5 to 8 p.m. Friday evening (November 16) and we're excited to see you downtown. Dozens of businesses and organizations have things planned for the evening, including open houses and activities, a winter farmers market, photos with Santa at Grinnell State Bank and double punches on your holiday punch card for any purchases made that evening. Michelle's Dance Academy will hold a holiday dance performance followed by the Central Park and Tree Lighting at 5:15pm in the shelter at Central Park and free horse-drawn carriage rides will be available through downtown from 5:30-8pm. A special thanks to Grinnell Mutual, Grinnell College and Los Girasoles for sponsoring Jingle Bell Holiday activities. For a complete list of activities and participants, check out the regularly updated list on our website. I hope to see you downtown tomorrow evening enjoying this festive tradition! I know it seems early (and it is!) but is anyone else sitting in their office listening to Christmas music this afternoon? Just me?! ;) In all seriousness, I want to share some details about the upcoming holiday season to let you know how you can be involved. I was approached earlier this year by a few folks inquiring how the community intended to utilize Central Park for the holiday season. I knew we didn't have the bandwidth to do something internally so we decided to host a few public meetings in the park (you may recall me inviting our readers to join us) late this summer. After just a couple meetings, we had a core group of individuals who have helped create a vision and are leading the charge to create various displays, both lighted and static, in various themes around the park (Candy Cane Village, North Pole, etc). 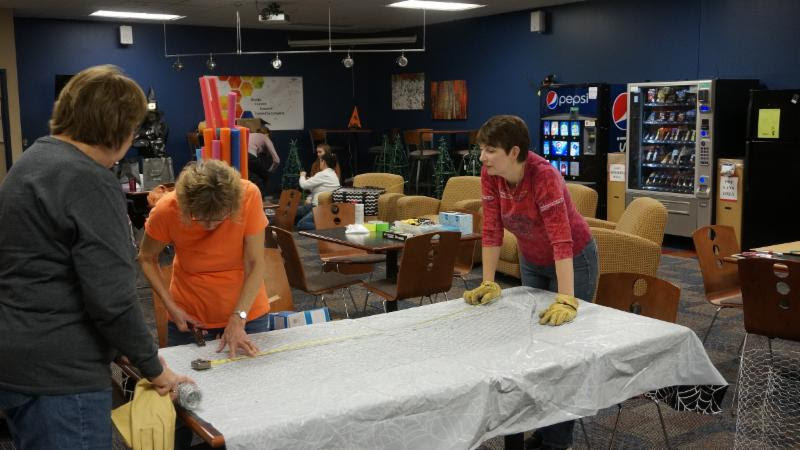 Volunteers gathered for a crafting night hosted by Iowa Valley Community College. Pictured: Janet Muckler, Kathy Szary, Gailanne Dill, Melanie Hempe, Cindy Strobel, Olivia Strobel and Kimberly Staples. Not pictured: Barb Hall, Jill Crotts and Jennifer McAlexander. we'll keep this page updated and share with you again as we get closer. Will you join me in giving a shout-out to this dedicated group of volunteers for their vision to bring a Central Park Holiday together? One of my favorite parts of this effort thus far is seeing it bring so many community members together, many of whom had not met one another until their involvement and many who have no affiliation with our organization. What a way to build community! If you're interested in volunteering in the coming weeks to help bring a Central Park Holiday to fruition, please let me know and we'll get you connected! p.s. New winter decorations will adorn the light poles in the Central Business District this holiday season! If you'd like to support this effort, you can make a secure donation here. As a community and individuals, we often choose how to best be good stewards of our dollars. Which is partly why I love the idea of the Big GIVE, an annual giving campaign now in its seventh year. For the month of October, community members are encouraged to give to the Greater Poweshiek Community Foundation to support any of their 39 funds. One of the greatest things about giving to this drive is that you can specify where your gift goes, or you can simply give to the greater good. Each of these causes is important to our community and county and we have the opportunity to support multiple efforts with just one donation. I was disappointed to miss the Spirit of Giving event last week which serves as a kick-off to the campaign while recognizing community members who have gone above and beyond. This year's event recognized several individuals who have been instrumental in Grinnell for a number of years, but also reminds us that there are so many people just like them in our community supporting organizations in meaningful ways. In the world of fundraising you're always challenged to raise more money, often with less time and staff, to reach more individuals. This year's Big GIVE campaign is looking to raise more than last year's nearly $200,000 to make an even bigger impact for these important community organizations. As you look at ways to give back to our community, please consider a gift to this or other great community organizations. There are so many ways to give back to Grinnell, and I encourage you to consider how you can make a positive impact. I know what you're thinking, isn't this the Grinnell Chamber's newsletter? You're absolutely right, but I hope you'll take the next few minutes to indulge me and read further. I'm at a state-wide Chamber conference with many of my peers this week (thus the reason for the tardy email) and had the opportunity to hear from my Marshalltown friend and colleague last evening regarding the devastating EF-3 tornado that ripped through the heart of her community nearly three months ago. Her account of the situation was both heartbreaking and powerful. As a community they have seen so much destruction, but the good that has come in the wake of tragedy is truly remarkable. People helping people whether they know them or not, and rising up to the challenge to rebuild a community both physically and emotionally. In the first days to follow the tornado, our recommendation was to stay away while they worked to assess the damage and while that was immediately helpful our neighbors to the north now need our help. Most people have now moved on with their daily lives and may have even forgotten about what happened to the community that day, but the rebuilding is just now beginning and they could use our help. Reach out to friends, colleagues you may have. Call the Marshalltown United Way to find out how you can volunteer to make a difference. Although smaller, Grinnell is a community not unlike Marshalltown and I am incredibly grateful our community was spared on that July day as I know it could happen in the blink of an eye. We often work in competitive nature with our peer communities, but now is a time for us to come together to make a positive impact. My colleague's words resonated with me, and I hope you'll take the time to reach out and continue to help in some way now that the media coverage has stopped and people are beginning to rebuild. Are you familiar with Grinnell's Giving Gardens? The first community Giving Garden was started in the summer of 2013 at Grinnell Regional Medical Center. The gardens were developed as a part of a community transformation grant, and are intended to give the Grinnell community access to fresh foods. Several locations were added in the summer of 2014, and each summer thereafter. As of today, there are Giving Gardens at GRMC, St. John's Lutheran Church, Summer Street Park (maintained by Rotary), St. Paul's Episcopal Church, Davis Elementary, Marvin Gardens, Grinnell Community Daycare & Preschool and Ahrens Park (began this summer and is managed by Imagine Grinnell). Anyone and everyone are welcome to harvest the produce; there is no cost to participate in the program and the gardens give access to fresh, nutritional, local foods. Any produce that is not collected by the community-at-large is gathered and donated to MICA, senior centers and other locations that serve food-insecure families. In the summer of 2017 alone, more than 2,000 pounds of food were donated to area agencies! The gardens are sustainable as well -- each having sheds to keep tools on-site, rain barrels to help with water retention and are managed by a committee with a representative from each of the organizations listed above. It may seem as though 'gardening season' is over, but September is a great month to secure some great produce, and the gardens are producing like crazy right now. Grinnell's Giving Gardens are a remarkable effort of community collaboration, and are there waiting for you! p.s. Don't forget to head downtown this evening to catch the Grinnell-Newburg Homecoming Parade (starts at 5:30pm) and cheer the Tigers to victory at the pep rally afterward! And don't worry about cooking - the Dollars for Scholars Dogs for Dollars fundraiser will be taking place in Central Park immediately following the parade. It's been three days, and I'm still reeling. Tuesday saw incredible voter turnout in Grinnell for the school bond issue, and while I'm personally disappointed the vote didn't pass I can understand both sides of the issue. What I cannot understand is the incredible division this vote has created in our community, and I am more disappointed in the community's response toward one another than anything. We are a community that comes together to help our own, that works together to solve challenging problems and celebrates together when great things happen. But that's not the community I saw Tuesday and in weeks leading up to the vote. I'm disappointed in both the 'Yes' and the 'No' voters and the hateful rhetoric I'm seeing on both sides of the issue. The school district has adopted the TEAM motto for the year: Together Everyone Achieves More. Maybe it's because this mantra was used in my household constantly as I was growing up, but it's always instilled in me the need and desire to work together in whatever ways possible. I implore everyone reading this to come together as a Grinnell TEAM to find a solution we can all get behind for the betterment of our community. We are a community that will rise to the occasion, but it will not come without compromise. From both sides. You see, here's the thing about compromise - rarely do both parties get exactly what they want. Instead, they work together to find the best possible outcome. And that's what I'm hoping this community so many of us love will do next. Come together. Talk civilly, respectfully and professionally about possibilities and opportunities, recognizing that we all have different ideas of what a solution should look like. Listen to each other. Don't listen to respond, but listen to listen. The BEST idea is yet to come - I firmly believe that. And I'm confident we, as a community, can come to a consensus that will better our community for years to come. Will we all agree? Likely not entirely, but we need to work like hell to make sure we come together for the future of this incredibly amazing place we all love so much. The retail of the future likely looks a little different than today, which may look vastly different from the past and our retailers must continually be nimble in a multi-faceted and ever-changing environment. I attended a Greater Des Moines Partnership event yesterday morning, along with a couple of our business owners, which outlined the future of retail. We know the retail landscape continues to evolve quickly and with good reason there's a lot of uncertainty right now given several recent announcements and closures of big stores along with the online and mobile sales boosts. But did you know that while we talk about the amount of online sales made (and yes, those purchases equate to a lot of money), online purchases still only account for approximately 10% of retail purchases? The average person would still prefer to touch and feel the product before buying it, and equally cite the customer service experience and interpersonal interaction as a major reason for their in-person purchases. The retail of the future will revolve around one of three center concepts: lifestage centers: areas catering to specific demographics; value centers: getting the best deal possible and idea centers: utilizing high tech and high touch to engage customers. Retail of the future will contain staples and convenience, and include experiential opportunities. If you're interested in the retail of the future and starting a new venture in Grinnell, let's talk! We'd love to help you take the next steps to make it happen. And would you all do me a favor? Continue to look local first, before you drive out of Grinnell or jump online to make your next purchase. I was in a meeting yesterday where the speaker talked about 'being authentic and real', so I decided to keep it real with you today. I'm not feeling it. How's that for honesty? I've got a list a mile long of topics I want to write about, but I'm uninspired to choose any of them at the moment. This month has been so busy for our office, and we just wrapped up our summer calendar of events this past weekend. Now that events have concluded I'm excited to jump back into some of the programming efforts we've set aside for awhile, and start to re-group as we begin our planning efforts for next year. But before I do that, I'm going to take a long weekend and come back next Tuesday refreshed and ready to tackle the week. Anyone else need a 'mental health day' from time to time? They're so important -- make sure you're taking the best care of yourself so you can continue to conquer the world (and I'll work to practice what I preach ;)). p.s. The Lions Club is hosting Ag Appreciation Day from 3-7pm at Central Park today. Come downtown and check it out and be sure to swing through the Farmers Market while you're here! p.p.s. If you've not taken the before-and-after school survey yet, would you take just a few minutes to do it? It's geared for parents with children ages 5-12 to give input towards the direction of a possible program and we'd greatly appreciate your help!